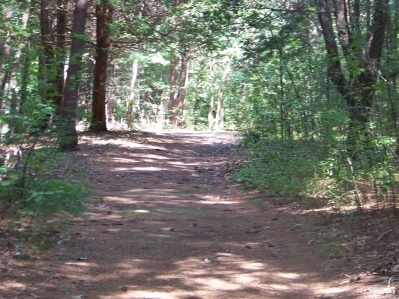 When you want to explore the hiking trails of Rockland, the George Anderson Rockland Town Forest is not to be missed. This now 43 acre (and seemingly ever increasing) park sits on the Rockland/Abington town border. 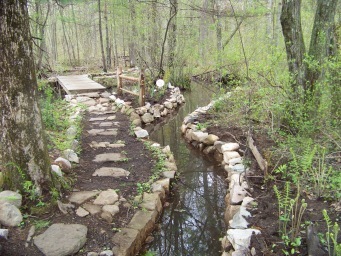 French Stream runs through this park which is an important scenic feature of the area. 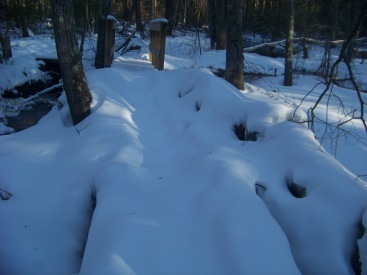 The Rockland town forest as it was originally called, was establish in 1982 with 20 acres of land secured from a Boston developer who wanted the land to remain undeveloped and recreational. George Anderson was the person instrumental in acquiring the land and at that time worked to transfer it to the conservation commission so that the intended purpose of the land could be realized. More recently in 2010, he was given the honor of having this park renamed in his honor to recognize of all the work he had done in it's development. helped George in the early stages of developing the park. installing the garden and picnic area. The two received help from many of the boy scout troops in the town. added an important feature to the forest is Dylan Carpino. can appreciate his contribution to the forest. 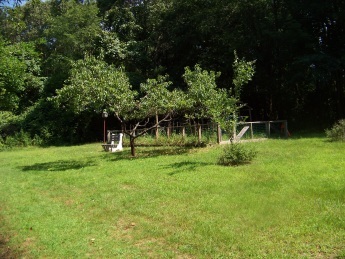 During Dylan's junior year at South Shore Vo Tech he constructed the bright yellow security gate 50 yards from the entrance of the forest. Previously if you visited Rockland Town Forest you had to park on the street as the only security measure was a heavy chain across the top of the entrance at the street. This gate was a project to gain an eagle scout ranking, but I'm sure it looked pretty good on a resume after finishing school! Who knew, previously I had thought the Rockland Highway Dept. had put this gate in. It's refreshing to know that a volunteer and one so young is responsible for such an important addition! 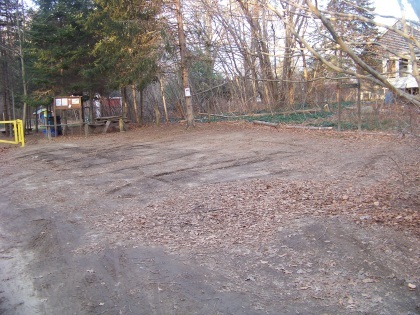 Dylan's gate made it possible to add the small parking lot that now exists at the front of the property. Another contributor to the park was Barbara Ferguson. She made the contribution in behalf of her late husband, Donald of whom was originally from Rockland. He formerly worked as the correspondent covering Rockland for the Brockton Enterprise. He was active in Rockland even after he had moved out of town. 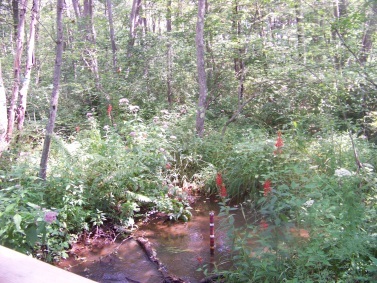 The 11,000 square feet of wetlands that border Spruce st and run along French's stream were donated with the stipulation that they not be developed. A good idea as I can tell from personal experience this area is a flood zone at certain times of the year. Development would only send that water into other properties surrounding the forest. 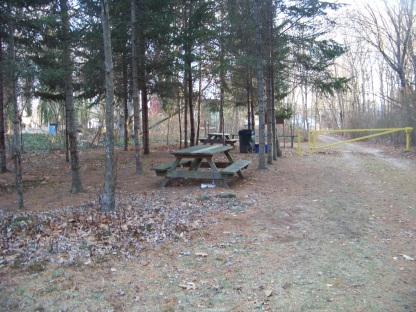 The material at the park entrance says the forest is comprised of 5 pieces of land. 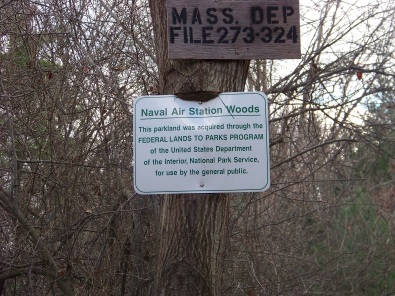 The original 19.8 acres, another portion taken by tax title, 8 acres given by an area builder of the Salem Estates, conservation land (Salem S t conservation lands) and naval air station woods. All these donations have led up to its present size of 43 acres. 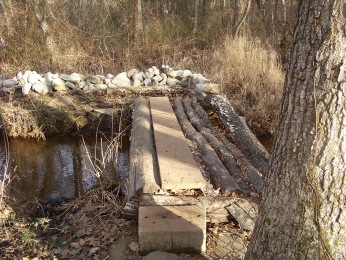 The more extensive trail building then began sometime in 2009 becoming aggressive in 2010 continuing to present day. 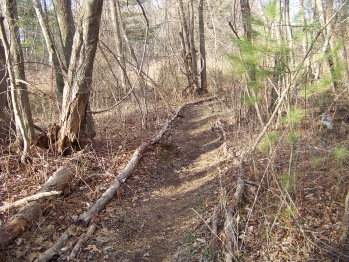 The main trail through the property, the Albert L Ingeno trail was mapped out and in some areas lined with forest material. 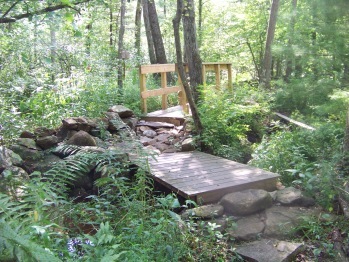 This reuse of forest material is a constant feature of the Rockland Town Forest. and have since been replaced with permanent structures. Much of the work has been on going, and then completed, transforming the forest into an almost magical place. 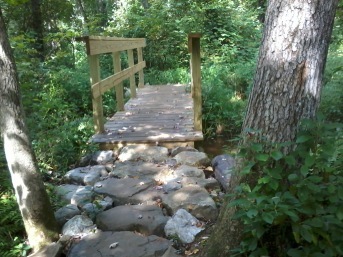 The blue loop trail was the next of hiking trails to be completed. Later called Don's Trail, and recently another named Jim's trail has been completed as well. 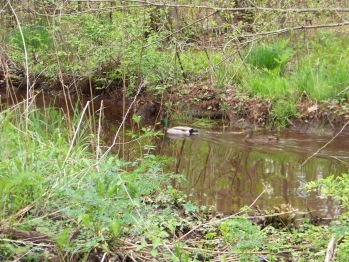 As the front page of Rockland hiking trails proclaims the forest comes alive in the spring. First with the water flowing from melting snow and early spring rain. Most noticeable are the emerging ferns. The vegetation is not the only thing bursting forth in the spring!! 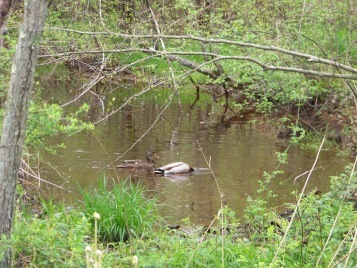 This pair of Mallards has been seen several springs and summers here in the forest. 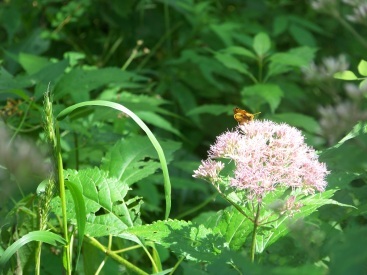 There are many flowers that bloom in the forest. Some are wild flowers, others are either those that were planted by former residents or drifting seed from nearby neighbors. 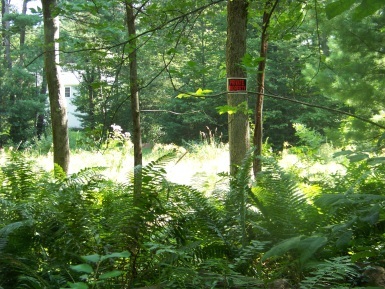 Some of those neighbors live very close to the forest boundary lines making the Rockland Town Forest seem as part of their backyard. 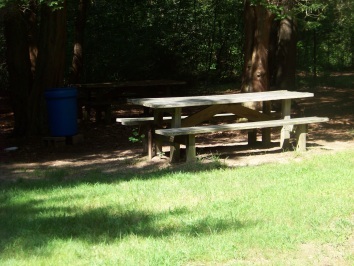 The forest is enjoyed by hikers, dog walkers, exploring children, exploring adults and children that geocache. 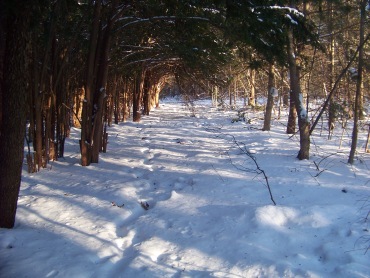 In the winter during snow, the forest is great for snow shoeing. for skiing the whole forest. 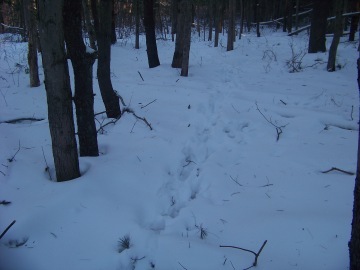 Winter is also a great time to estimate how much wild life exists in the forest. Their tracks are everywhere!! Only problem with winter in the forest is that trail head parking lots aren't a priority plowing item. Can you imagine?? I've seen some evidence of those trying to ride a bike through the forest, but again the bridges make that difficult and I'm not sure it would be appreciated. In the spring and winter water proof boots are a must. Spring thru late fall insect repellent is necessary. In late spring and most of summer it will be most unpleasant without the repellent. As always dogs should be on a leash and restrained when necessary. Picking up after your dog is always appreciated. Motorized vehicles, alcohol and hunting are prohibited on these hiking trails. From exit 14 follow Hingham St into Rockland. Take a right on Webster St (route 123). Follow to end at Union St in Rockland Center. Take a right. At next set of lights take a left on North Ave. Follow past intersection where route 139 emerges. Town Forest is on the right immediately. Small parking lot that accommodates 3-4 cars. 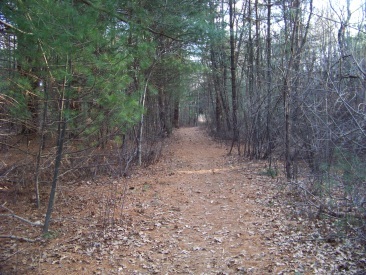 main trail 1/2 mile. Couple side trails to add to length.